We met Brittany via Instagram, believe it or not! We had been following each other’s pages for a while, and when Brittany emailed us and asked us questions about our gear, editing, etc., one thing led to another, and she was heading to Birmingham from south Alabama to spend the day with us! Now, if our future children come up to us one and say, “Mom/Dad, I met someone on Instagram, and I am going to drive to their house to hang out with them,” we’re going to say, “Over our dead bodies!” But we like to think this situation was far less stranger danger than it may sound! In this case, Instagram inspired a friendship! The internet can be a wonderful thing, can’t it? We loved getting to know Brittany, hear all about Brittany Jayde Photography and her business goals, and be that “safe place” for her to ask questions, vent, and discuss her business. We started the day talking about branding and social media over cookies and pink lemonade. After a quick course on white balance and exposure, we headed that afternoon to meet one of our sweet wedding couples for some real-life practice. 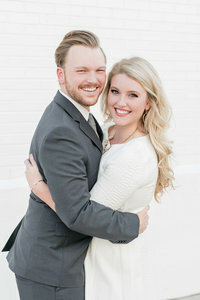 Jordan and Spencer are so adorable, and we were so glad that they jumped in to be our models. We loved being able to give Brittany the opportunity to ask questions in realtime and to see how other photographers approach couples portraits. She got some awesome shots, and we enjoyed snapping some as well (see ours below!)! Aren’t they adorable?